From a young age Tasch knew exactly what she wanted to do with her life-work with animals. 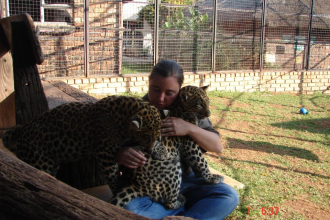 Having studied a diploma Nature Conservation in South Africa at TUT, acquired her FGASA *Field guide and certificate in environmental education, which only fueled her passion. Then came adding the volunteers and students and combining both was a bonus. her work experience included various bird of prey species, small cat species such as caracal, serval and ocelot; big cat species including lions, Siberian and Bengal Tiger, Jaguar, Puma, leopard and Cheetah. being very well traveled, she loves meeting new people and listening to their paths in life. Her hobbies include animal tracking, photography (an expensive hobby!!) and teaching people from all walks of life about her beautiful country and the conservation efforts in it.